Surrounded by her friends, Sabrina (Kiernan Shipka) chats with someone who looks to be Michelle Gomez’s Mary Wardwell. Hail Satan! As the temperatures start to drop and autumn slowly creeps back into our lives, we inch ever-closer to the haunting debut of Netflix’s The Chilling Adventures of Sabrina. With a little over a month to go before the teenage witch returns, here are some new looks at Sabrina’s circle of family, friends, and devilish cohorts. Hint: Michelle Gomez makes pure evil look good. These new photos come on the heels of the first trailer, which spells out the creepy adventure we have in store. Based on the ongoing comic book saga, the show stars Kiernan Shipka as Sabrina Spellman, a young witch who’s supposed to sign a contract with Satan to become a full witch on her 16th birthday. Only problem: She’d have to leave her old world behind, which includes her boyfriend Harvey (Ross Lynch) and two best friends. Will she choose the Path of Night or the Path of Light? If Gomez’s Madame Satan has her way, she’ll definitely go down that Night path. But the biggest question is: Where does it lead? Michelle Gomez is looking perfectly devilish as Madame Satan, a servant of the Dark Lord who’s possessed Sabrina’s favorite teacher to ensure she goes down the Path of Night. Miranda Otto plays Aunt Zelda, a devout follower of the Church of Night who’s determined for Sabrina to follow in her family’s footsteps. Here’s Lucy Davis as Sabrina’s other guardian, Aunt Hilda. Definitely kinder than Aunt Zelda, but still just as evil. It’s Sabrina’s beau, Harvey Kinkle (Ross Lynch). In this version, he’s the son of a coal miner who doesn’t know anything about Sabrina’s witchy secret. Is that a love triangle I spy? This is the first official look at Nicholas (Gavin Leatherwood), a warlock who locks eyes and magic with our favorite teenage witch. Another look at the Weird Sisters, played by Adeline Rudolph, Tati Gabrielle, and Abigail Cowen, three young witches in training who wear creepy Wednesday Addams dresses. It’s Father Blackwood (Richard Coyle), the High Priest of the Church of Night, glaring at Sabrina over...I’m guessing over the fact that her latest term paper is overdue. Here’s Ambrose (Chance Perdomo), Sabrina’s cousin who’s stuck at the Spellman Mortuary home under house arrest. 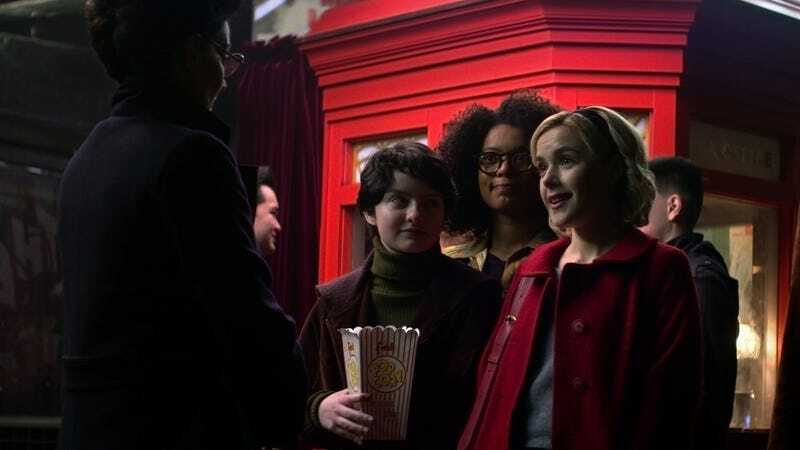 Two new characters created for the show, Rosalind (Jaz Sinclair) and Susie (Lachlan Watson), two of Sabrina’s best friends—the latter of whom has started a Wicca club at school and has supernatural problems of her own at home. Does that mean another witch is in their midst? Now I’m craving some popcorn. Sadly, we still haven’t gotten another look at Salem, Sabrina’s familiar. Given how we recently learned Shipka is allergic to felines, I’m hoping this doesn’t mean a reduced presence of Sabrina’s coolest cat. The Chilling Adventures of Sabrina arrives October 26.